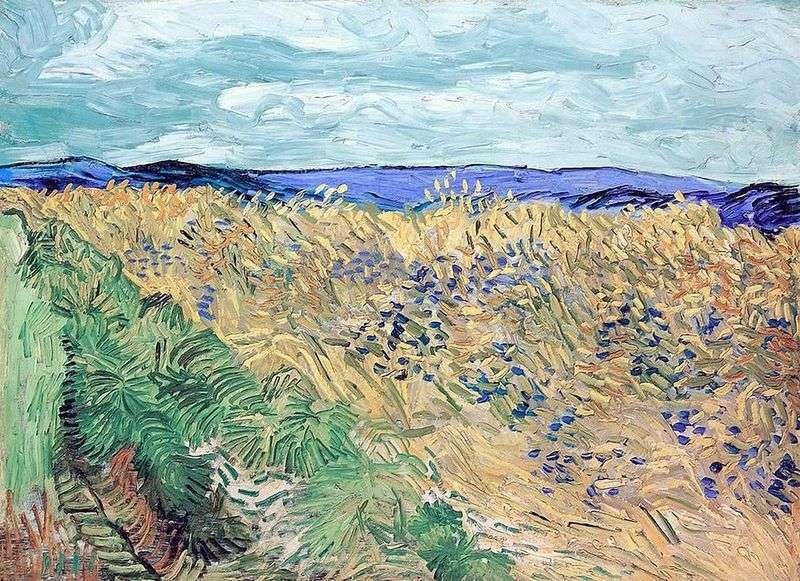 Wheat fields around Overa attracted the attention of Van Gogh, and their images fell on the canvases one by one. The emptiness of the boundless spaces seemed to reflect the inner state of the artist’s exhausted illness. In the windswept ears, surrounded by hills and sparse vegetation, Vincent found the peace and quiet that he needed so much during this period. In this landscape, he depicts the edge of a wheat field, stretching out into the distance. Van Gogh divides the picture into several clearly defined color bands that converge at one point on the horizon. Despite their contrast, the color of the picture remains soft, almost pastel. The sky is covered with gray clouds, and in the background a bright blue hill rises, surrounded by a dark outline. This color brightly speckled with cornflowers is repeated among the ears, in the image of which Vincent used the softer combinations of yellow and yellow-blue mixture. The roadside of the field is overgrown with bunches of green grass, through which the earth is looking through. Van Gogh does not write out the details, but achieves expressiveness due to the different directions of smears. Wheat sway under the light winds, and gray clouds in the sky foretell the rain. Nevertheless, the picture looks very bright and peaceful, and in combination of colorful stripes an optimistic positive start is seen. Description and meaning of the painting Wheat Field with Cornflowers by Vincent Van Gogh.